Ah, Cottonwood, how we love thee! Cottonwood? Whaddaya mean? Yer in Idaho! Well, yes, we're in Idaho but we're in Cottonwood tonight and we love this special place. Technically, it's the BLM Cottonwood Campground near Ellis, Idaho, perched alongside The Salmon River. But to us and everyone else it's known simply as Cottonwood. You say Cottonwood here and everyone knows what and where you mean. So, when we told people “We're going to Cottonwood,” they smiled and nodded and we're feng shui. We go way back with Cottonwood—all the way to June 2002, believe it or not. We were on a Forest Service Secret Shopper trip and had been all the way up far north of West Glacier and came back down through Missoula. After a long day of Secret Shopping, we drove through the Bitterroot Valley, over Lost Trail Pass and down through North Fork and Salmon City, Idaho. It was getting late in the day and we were both antsy and tired and, yes, getting cranky, too. Driving The River Road, as US 93 is known south of Salmon City, can get a little tedious and testy at times. And so it was late on one of those really long, long days of the June Solstice that we spotted the sign to Cottonwood. Little did we know when we turned in here that fateful evening that we would develop a lifelong relationship with Cottonwood. And so it is that we are here at Cottonwood once again. We've been gone way too long and we're danged happy to be back. It would take a small novel to tell you about all the times we've camped here and why and what for and when and with whom. And the novel would get bigger if we told you about all the other people we know who have camped here. If ever there was a campground that was truly Home to us, it is Cottonwood. There is so much to say about this special spot, we are overwhelmed just thinking of even trying to put our experiences here into words. So we won't. We woke up this morning in a fog. A lot of people say that after a Saturday night party but, no kidding, we were really fogged in. And the fog didn't lift out until nearly noon. So we played pickleball in a fog. It was kinda cool in a strange sort of way. After a couple of hours of pickleball, we returned to Sunny Gulch and the gulch was actually beginning to live up its sunny name. We hooked up the trailer in a wink of an eye and departed before noon, which is also well before the 1 PM checkout time there. It was a beautiful drive downriver through the canyon with almost no traffic. Blissful mid-Sunday Drive. We arrived at Old Sawmill well before 1 PM and could see that the festivities had already begun. Old Sawmill provided free burgers and all the trimmings with home made potatao salad and baked beans free to everyone who showed up. It was almost like a mini-Clayton Area Family Reunion. One of Custer County's notable citizens, Doug Hammond, was on hand to represent the Salmon River Shrine. Meanwhile a Major Type A (as in Capital TYPE A) horseshoe tournament took shape and got underway. We spent three hours taking photos and trying to capture the essence of the event. It was great. We love The People of The Clayton Area and it was so fun to be with so many of them again. 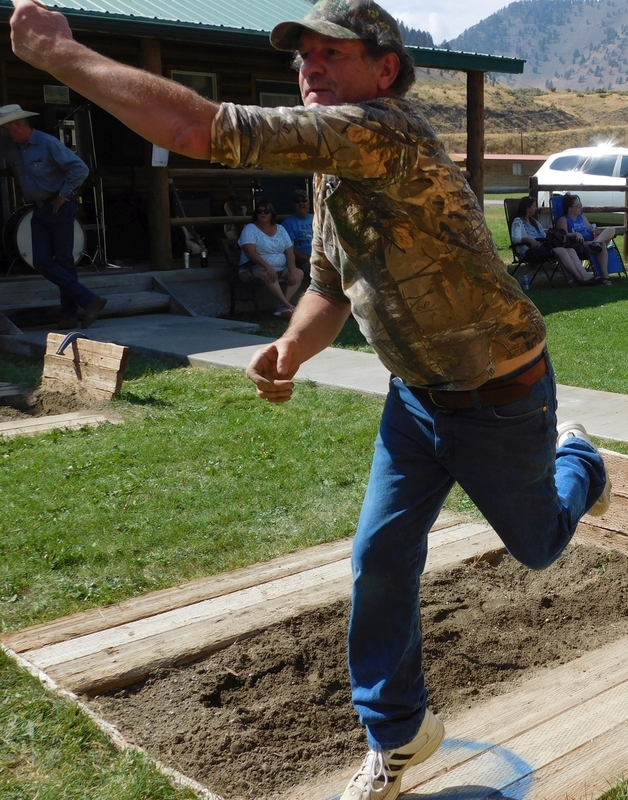 Man, they toss some mean horseshoes! Howard Cutler and his band played some of their finest music. Everywhere we looked, it was a Classic Norman Rockwell scene from a cover of The Satuurday Evening Post. We pulled out of Old Sawmill after three thirty and got into Lamb's Market in Challis going on about 4:30 PM. Lamb's was our Foodie Mecca for four years in 2004-05-06-07. From our lonely outpost at Bowery Guard Station, it was a full three hour round trip to Challis, Lamb's and laundry. Usually, whenever we “went to town,” as country people say, we spent 6-9 hours away from home. Lamb's looked today just as it has always looked. It's one of those timeless places that never seems to change one iota. I knew that I could walk to the “bread department” and know precisely were on the shelves the best quality and best priced bread would be located. Sure enough, I could have done it blind-folded. Ditto every other aspect of the store. We love that store. We spent ten bucks on some so-called essentials and then proceeded to set forth on arguably one of our favorite All Time Drives—Challis To Cottonwood. When I go to Heaven, I want the road from the Pearly Gates to the Interior Of Heaven to look just like the Challis to Cottonwood Drive. If it doesn't look the same, I am going to complain mightily to St. Peter and maybe even God Himself! I might even want my money and life back! Word has got arouund about Cottonwood. We didn't expect to see anybody here on a Sunday. WRONG! We were lucky to get a spot. We had assuumed we'd be able to get one of the coveted riverside spots. WRONG! They were all full. Luckily, we got a pull through spot and easily leveled up the trailer. We're not bothering to unhitch as we're leaving fairly early on Monday. We're not lolly-gagging here at Cottonwood. We just came back to savor the romance of this place and remember and reflect on all our previous Life History here. Duane Wilson is the Camp Host and he has been here NINETEEN YEARS! Seriously! Duane is like a distant Uncle to us and he told Susun right away that it has been 3 years since we've been here. Duane might as as old as Saint Peter but his mind is sharp as a tack. We're posting this on Duane's WIFI range extender that he gives out only to Dear Friends. We've known Duane since we first met him in June 2002. Coming back here and seeing Duane still alive and kicking and riding his bicycle around camp to check up on and gab with everyone is a very grounding experience. In this day and age to know that some things never change such as Lamb's and Duane and Cottonwood and the Challis-To-Cottonwood Drive is a deliciously comforting thought!